On the way to western stardom with ‘My Western Horse 3D’. Hamburg, 16th August 2013 – Many dream of becoming a western riding star, breathing in that prairie air and learning the secrets of the western riding style. Now all this is possible at any time with the Nintendo 3DS game ‘My Western Horse 3D’. 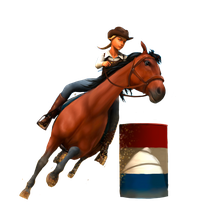 The game lets players dip into the exciting ranch lifestyle and experience a new thrilling adventure as a cowboy or cowgirl in realistic 3D graphics! The Nintendo 3DS game comes without any kind of packaging and can be quickly downloaded from the Nintendo eShop anywhere at any time. Taking the role of the young Karla on a visit to her Aunt Polly’s stud farm, players have to show they have what it takes. But before they can access the most popular western riding disciplines through Reining and Barrel Racing, they must first of all prove they have both the ability and a sense of responsibility. Because Aunt Polly checks very carefully to see who is going to be allowed to rider her beloved horses. But using their caring skills and reliably completing the daily routine tasks players will soon be able to convince her of their suitability. Especially since her favourite horse develops a special liking for them. And so through love and training, players have every chance of making it and being well on the way to becoming a real western riding star. • Huge range of horse care products, riding accessories etc. ‘My Western Horse 3D’ is available right now at €39.99 / 29.99$ in the Nintendo eShop. To visit the virtual marketplace, players should look in ‘System Settings’ for an ‘Access Point’ in their locality and then use this to make an Internet connection. The game can then be easily downloaded from any location.